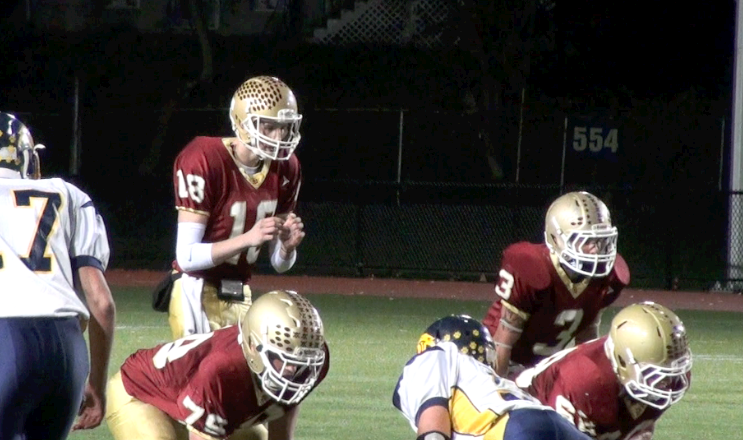 Senior quarterback Luke Brennan and the Doherty offense rolled Friday night. So yeah, that Luke Brennan kid is pretty good. As I mentioned in last week's postgame blog, the Doherty senior isn't often mentioned with the other great CMass QBs (Smiley from SJS, O'Connor from Leominster, Kierman from Quabbin), but he's quite a player himself. If five touchdowns in a playoff game where your team goes down 7-0 out of the gate isn't a big-time performance, I don't know what is. The Highlanders are still my favorites in Division 4, not just in Central Mass, but in the whole state as well. They wouldn't be if they didn't have one of the region's best quarterbacks. Time to give the kid his due, he's a guy you can win a state championship with. You can check out some highlights of his big day below. On the other side of the field was Quabbin's prolific passer, senior QB Dylan Kierman. He started hot, throwing a TD on the game's first drive, but a mixing of coverages and increased physicality from the Doherty defensive backs stymied the Panther passing attack. Kierman finished the game with four touchdowns (Though two came in garbage time) and two interceptions (Though one of those was a desperation heave on fourth down). It wasn't the way he wanted to end his high school career, but the talented signal caller did lead Quabbin to the playoffs after a disappointing 4-7 campaign in 2012. He also led Central Mass in passing yards and touchdowns the last two years, and and he left Foley Stadium with his head held high. "Well, last year wasn't what we wanted, but we knew we had the pieces we wanted offensively," Kierman said of Quabbin's 2012 season. "This year, going 5-2 in the regular season, we knew we had some momentum going into the postseason. Actually, Doherty was the one team I didn't want to see, because I knew they matched up well against us with their athletes. They're a good team, so give all the credit to them. They played hard, we played hard, and I'm not disappointed in our guys at all, because I thought we gave it our all the whole game." Brennan stole the show, but he couldn't have done it without the stellar play of classmate Alfred Adarkwah. To say Adarkwah is a red zone threat would be an understatement. The 6-foot-4 wideout grabbed two touchdowns against single coverage near the goal line, and simply ran past a corner to go 74-yards untouched on another play. With all that physical ability, color me confused as to why Adarkwah isn't drawing more D1 interest. Not saying that he won't have a great time playing somewhere smaller, but if I'm the coach at UConn or some other struggling program in the Northeast, why wouldn't I offer a 6-foot-4 receiver with great hands, a solid vertical leap and surprising speed? Well, if someone doesn't swoop in on him late, Adarkwah will happily go through a smaller recruiting process. "I'm hearing from a few (schools)," Adarkwah said. "Wagner, Assumption, Stonehill and UMass Amherst." So, at this point, UMass in the only FCS program sniffing around. Those guys do play in Gillette Stadium, so maybe Adarkwah can get a taste of that place in the coming weeks before making his college decision. Doherty senior defensive back Shawn Jackson has made a name for himself the past few weeks. First, it was his crunch-time pass deflection against St. Peter-Marian in the regular season finale, and now Jackson effectively ended things against Quabbin by picking off Kierman in the third quarter. I mentioned Adarkwah, who does a ton for the Highlanders on both sides of the ball, and you can never mention Doherty without discussing Boston College commit Isaac Yiadom, a receiver and defensive back, but Jackson is really tying this secondary together. The Highlanders have three ball hawks now, plus seniors Tyler Kmon and Peter Franco are also coming up to lay the wood. Let's just say I wouldn't want to fall behind and have to throw on this team.